Q. Are your estimates free for Hardwood Floor Service in Boise and the surrounding area? A. Yes, give us a call and we’d be happy to come to your home and give you a free consultation. Q. How Dustless is the dust containment system? A. Our dust management system goes beyond just less dust. Its focus is on air quality and having a livable remodel. A number of our clients choose to live in their home while we work. We don’t say we are “dustless” or delivery a 99% dust free, we feel that is misleading. We will leave your home clean and not a dusty mess. Q. We want our floors stained, how do I choose my stain color? A. We offer consulting and provide you with the tools and resources with color selection. There are so many varieties in wood that simply showing a sample in a showroom or brochure would not fully do it justice. Each floor will take to the stain slightly differently; we have found over time this is the best way to show you what the color will truly look like. We can also arrange to show stain samples before the job begins if arrangements are made. Q. We have hired Integrity Hardwood Floors for our job. What time can we expect the crew to arrive on our scheduled work day? A. We value your time as well as ours. We plan with you the schedule, access to your home, and estimated time frame for completing your project. You will receive a call or notification the day before and after each day with the progress. If you have a request in time we can do our best to suit your needs. Q. I just had my floors sanded. How long until I can walk on them / move my furniture back onto them / put down my area rugs? A. A large benefit to our BONA system is it’s quick drying. Roughly 3 to 4 hours after the coat has been applied you can walk on the floor. Please do so in a hard sole shoe, not bare foot, and not socks. Furniture can go back 24 hours after the last coat has been applied, and you should wait three days to one week for area rugs to go back. Q. I just had my floors done, what’s the best way to maintain them? A. Here is our link for how to best maintain your hardwood floor investment. Clink here How To Maintain. We offer quality cleaning products we have tested and highly recommend, contact us for more information. Q: How soon after the in-home consultation can my stairs be done? A: From in-home consultation to start of work usually depends upon the options you choose. Some materials may be custom-ordered and may take some time to get in. You may always call us in our offices and be kept up-to-the-minute on your orders – we welcome your cooperation in every phase of your work with us. Q: Does the decreased humidity in the winter affect my hardwood floors? A: In many cases, wood floors respond to the lower humidity by contracting or shrinking. If the wood contracts significantly, small gaps may appear between the boards. This is normal, but can be prevented with proper precautions. One of the best ways to ensure that your wood floors will give the performance you expect is to make sure your home has proper humidity controls in place. This means using a humidifier to maintain optimal moisture levels in your home. Keeping levels above 40% in the winter will help prevent gaps from appearing in your wood floors. Q: Can certain rugs harm my new wood floors? A: Yes, they can. Our advice is to avoid solid foam backed rugs, which can retain moisture and dirt, damaging your flooring. Instead look for waffle-pattern backed rugs and 100% natural rubber is best. Everyone has seen the commercials or home show vendors demonstrating a steam cleaner magically sanitizing, disinfecting, deodorizing, and cleaning a wood floor. But that doesn’t mean that wood flooring manufacturers or finish manufacturers think steam cleaners are appropriate for a wood floor; in fact, some have begun to specifically mention steam cleaners in their list of don’ts. Inspectors are also starting to come across floors that appear to have been destroyed by repeated steam cleaner use. Peeling finish, whitening finish and cloudy finish are just some of the side effects being reported by people looking at floors after steam cleaning. In general, the oft-repeated industry saying “Water and wood don’t mix” holds true. Unless the wood flooring or finish manufacturer says it’s OK, it’s safest to assume steam cleaning is a no-no on a wood floor. Q: I’ve been using a product on my wood floor that says it is a wood polish/conditioner. Now it seems like my floor has a sticky film all over it, and I can see footprints in it. How do I get this residue off? Unfortunately, many home owners are surprised to discover that, although the product they used said on the label it was for wood floors, it wasn’t really recommended for wood floor finishes … and now they have a big mess on their hands. Some of these products seem to leave a film on the floor that is very difficult to remove. Others may not leave a sticky film but may cause contamination problems down the road when the floor needs to be refinished. If you know the manufacturer of the wood floor or the finish on the floor, call and ask for their recommendation as to what to do. If you don’t know, call our wood flooring professionals, we can review and recommend a product specifically designed for stripping such residue off a floor. If not, the floor will probably require re-sanding. Vacuuming wood floors is a great idea. Dirt and particles that are left on the floor act like an abrasive when people walk on them, so vacuuming them as often as possible will prolong the life of the finish. Couple caveats: Don’t use a vacuum with a beater bar, which can damage the finish. Also make sure the wheels are in good condition and roll easy. Use walk-off mats and area rugs at all doorways. Put floor protectors on the bottom of all furniture and anything else (baby exercisers, toys, etc.) that might rub on the wood floor. Consider using runner/area rugs in high-traffic areas. Life happens on our hardwood floors. Don’t let life’s little mishaps ruin your day or hardwood floor. Here are some simple ways to address normal issues. Scuff marks getting you down? A bit of baking soda on a damp sponge will erase them or try a tennis ball. Just make sure you apply light pressure so you don’t change the sheen. Take caution with a high-gloss finish, as it can slightly dull glossy floors, but duller sheens are usually fine (when in doubt, test it in an inconspicuous spot first). 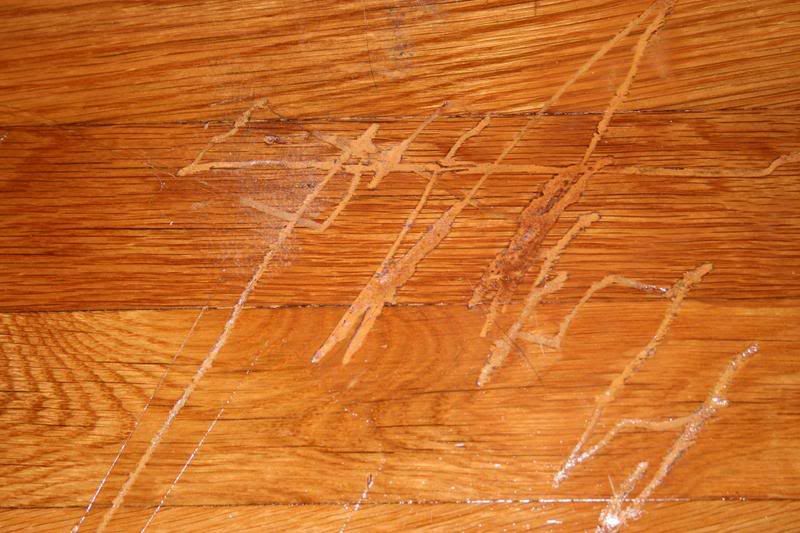 Noticed a stubborn food, water or grease stain on your hardwood floor? Always use a commercial cleaner to treat this problem. One that is approved by the manufacture or trusted hardwood floor expert. Hairline cracks between the floor? Don’t panic and attempt to fill them. Dry heat during the winter months’ causes wood floors to shrink and crack. Cracks should close up during the summer. I use a humidifier the day we turn the heat on, it is healthy for my sinus and the floor. It might be time to call a professional to review them. This can be caused by improper cleaning techniques or products plus daily cleaning cannot clean deep enough. A Deep Clean should be done every 12 months to revive the floor. If more is needed a refresh will even the sheen and provide a protective wear layer. The floor is prepped and a new coat applied. Recoating is necessary about every three to seven years based on your lifestyle on the floor. Scratched or dented my hardwood floor? Identify what type of scratch you have: Surface Scratch, just in the finish coat or protective layer. Minor Scratch, makes a slight indention into the wood possibly through the color. Deep Scratch, more of a gauge past finish into the wood. This is more challenging, certain products could hurt the floor more than help or make the issue look worse. Stain pens, fill and other options can work with some simple techniques. We will tackle these topics more in depth, to help you live life on your hardwood floors with less worries about “life on the floor”.